An original letter of correspondence between Joshua Coffin Chase and Isleworth packinghouse superintendent Corbett Hutchinson. 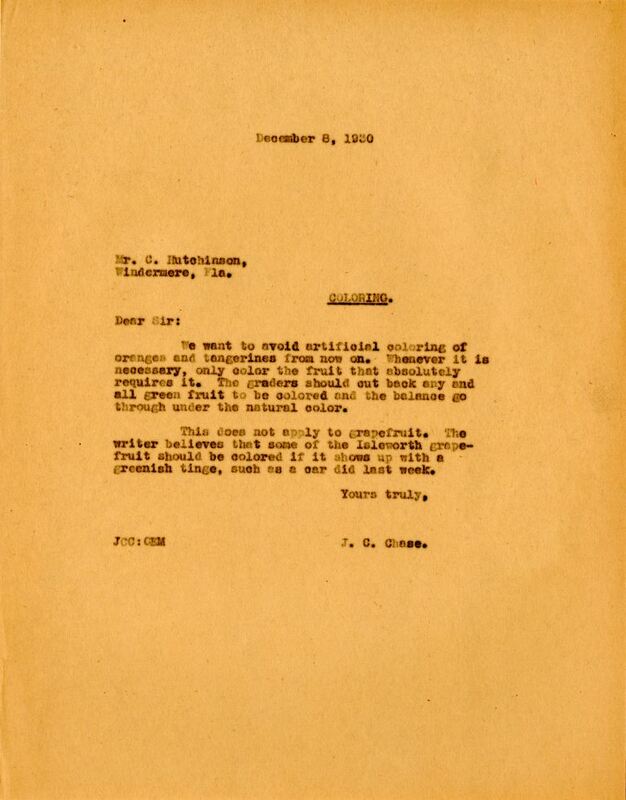 Topics discussed in the letter include ceasing to artificially color oranges and tangerines and the continuation of the artificial coloring of some of the grapefruit at Isleworth Grove. Original letter from Joshua Coffin Chase to Corbett Hutchinson, December 8, 1930: box 49, folder 20.91, Chase Collection (MS 14), Special and Area Studies Collections, George A. Smathers Libraries, University of Florida, Gainesville, Florida. 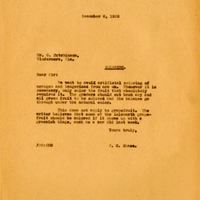 Digital reproduction of original letter from Joshua Coffin Chase to Corbett Hutchinson, December 8, 1930. We want to avoid artificial coloring of the oranges an tangerines from now on. Whenever it is necessary, only color the fruit that absolutely requires it. The graders should cut back any and all green fruit to be colored and the balance go through under the natural color. This does not apply to grapefruit. The writer believes that some of the Isleworth grapefruit should be colored if it shows up with a greenish tinge, such as a car did last week. Chase, Joshua Coffin. “Letter from Joshua Coffin Chase to Corbett Hutchinson (December 8, 1930).” RICHES of Central Florida accessed April 25, 2019, https://richesmi.cah.ucf.edu/omeka/items/show/2773.